Immediately after the Indian government announced a bill criminalising “triple talaq”, the proposal has been mired in controversy. Banning the practice of a husband divorcing his wife by uttering “talaq” three times within Muslim communities has been under discussion in India for years now. The practice has rendered hundreds of Muslim women homeless, forced out of their matrimonial homes overnight, with many learning that they have been divorced from relatives, by phone or even by a text message. A recent studyfound that 79 percent of women divorced through “triple talaq” did not receive any maintenance from their former husbands. Despite the Supreme Court having declared the practice void in August last year, activists on the ground confirm that it continues unabated. Last week the lower house of the parliament passed a bill seeking to criminalise instant “triple talaq”. If the bill is voted into a law, men found guilty of divorcing their wives through “triple talaq” could face jail time of up to three years. The reactions to the “triple talaq” bill within the Muslim community have been varied. As a feminist, what has troubled me the most are critics of the bill saying we should rejectit because it is a right-wing government that is putting it forward. Equally disturbing are claims that the criminalisation of “triple talaq” could be misused with it being a ploy to jail more Muslim men. The government’s track record of safeguarding the rights of minorities is quite poor indeed. It has failed to provide proactive relief or justice to families of those lynched by cow vigilantes and has taken little to no action against its own party members allegedly using hate speech against minorities. But to use this failure to reject a legal amendment that is in line with a decades-old struggle of ordinary Muslim women is prejudicial. It is important to remember that this bill has not come about in a vacuum and is a result of years of struggle of Muslim women’s groups demanding codification of Muslim Family Law in India. There is nothing wrong with Muslim women activists rejoicing and celebrating the fact that they will not have to study court rulings in divorce cases or find ways to incorporate “triple talaq” as cruelty under the Domestic Violence Act any more. Critics also argue that the government, as well as Muslim women, are likely to misuse the law. They say that survivors of “triple talaq” are guided merely by concerns of maintenance and economic security and not dignity. Arif Mohammad Khan, Islamic scholar, former cabinet minister of the Congress party and one of the chief architects of the present bill has the right response to these accusations: “Why are we undermining the intellect of a Muslim woman? Are we not naive to argue that despite wanting to save her marriage, she will misuse this law to put her husband behind bars? If anything, this law will ensure that a Muslim man thinks a hundred times before uttering the word talaq thrice in one go and then forcing her to leave her matrimonial home,” he told me. We have to recognise the importance of deterrence in law, the quantum etc can of course be debated. There are other civil law violations, such as bigamy, which invite penal action, why should triple talaq be an exception? Making “triple talaq” an invalid practice under the civil code has not really worked. 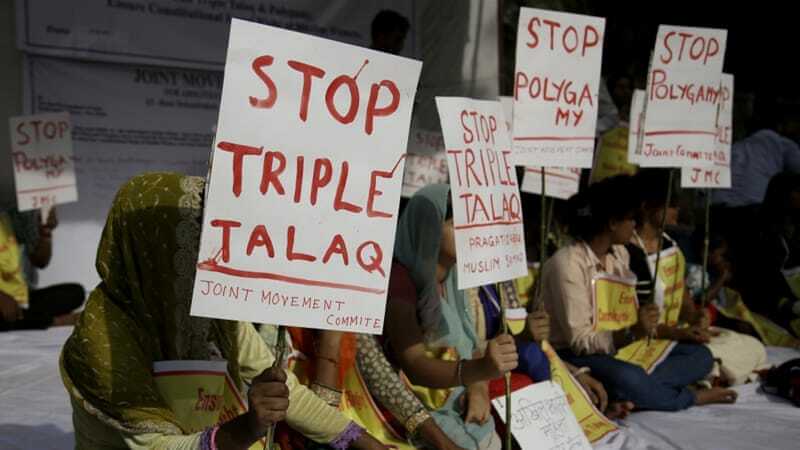 Activists working on the ground with Muslim communities confirm that cases of “triple talaq” continued even after the Shayara Bano judgment by the Supreme Court which rendered the practice void in August 2017. There have also been some academics who have argued that fixing a high amount of dower could serve as a deterrent to divorce. But this is in a complete contradiction with the demands of Muslim women who have been asking for dower to be paid at the time of marriage. They do not see dower as a deterrent to divorce, but rather as a right of a Muslim woman to receive financial security from her husband at the time of marriage. These arguments are in a lot of ways taking the movement for gender equality by Muslim women, many steps back. Yet it is right to argue that that the government should have consulted Muslim women’s groups before tabling the bill, and accepted suggested amendments to it to make sure it meets its purpose: that of stopping Muslim men from continuing to give irrevocable divorces to their wives despite the Shayara Bano judgment. Noorjehan Safia Niaz, cofounder of Bharatiya Muslim Mahila Andolan (BMMA) – an organisation which has worked for the ban on “triple talaq” for years – has suggested that penal action must be undertaken at the behest of the aggrieved wife, and must be non-cognizable and bailable. “The ordinary Muslim women are with us and are celebrating,” says Zakia Soman, cofounder of the BMMA. In an appeal to the Rajya Sabha to pass the bill, BMMA also calls for the need of a comprehensive codified Muslim family law based on Quranic injunctions and in compliance with constitutional provisions. It is not too late for the government to listen to Muslim women activists and amend the bill. The reason why activists who work with Muslim women on the ground and with scores of survivors of “triple talaq” support the bill is because they see the destitution that this practice has caused. They do not see merit in losing an opportunity for reform because the party in power is right-wing. This bill could be a stepping stone towards a more comprehensive codification of gender-just Muslim family law reform in India.